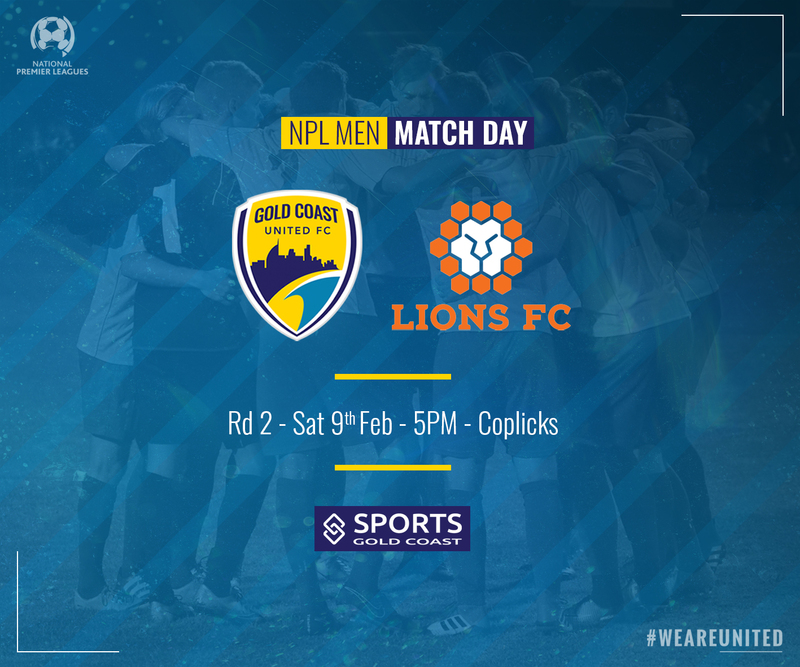 Saturday night marks the first Men’s National Premier Leagues Queensland fixture at Gold Coast United’s new home, the Coplick Family Sports Park in Tallebudgera and what an opener! The Club hosts the reigning NPL Premiers and Champions, Lions FC, on what’s sure to be a great night of quality football. Lions 2018 success was achieved off the back of the leanest and meanest defensive record in the competition, conceding just 11 goals across 26 matches. Michael Thwaite, who has returned to the club as captain, is one person who knows that successful seasons are built on miserly defences, as Lions proved last season. While pleased with United’s second half fightback against the fast starting Jets last weekend in Round 1, Thwaite concedes that a solid start will be imperative if United are to get anything out of this week’s match. “It’s a bit of an eye-opener for me too, I need to organise a bit better.” said Thwaite, who played his first competitive match at Moreton Bay since joining United from Western Sydney Wanderers. Lions slipped up at home in Round 1 when newly promoted Peninsula Power won the inaugural Football Foundation Cup last Saturday 2-1 at Richlands. Coach Warren Moon’s 2018 squad remains largely intact and the addition of Joe Duckworth (Pride) and Chris Hatfield (SWQ Thunder) has added to the squad’s depth. Mercurial striker Marek Madle remains the biggest threat up front. Defensively captain Matija Simic and the ubiquitous Luke Borean in goal will be out to keep a clean sheet Saturday night after shipping a few first up. Lions scored an injury time winner to deny United a point in Rd 10 at Richlands in their first meeting of 2018, a 91st minute goal snatching a 3-2 win on the death. No such concerns for the visitors though at Robina when Lions smashed 6 unanswered goals past United in the reverse fixture in Rd 23.